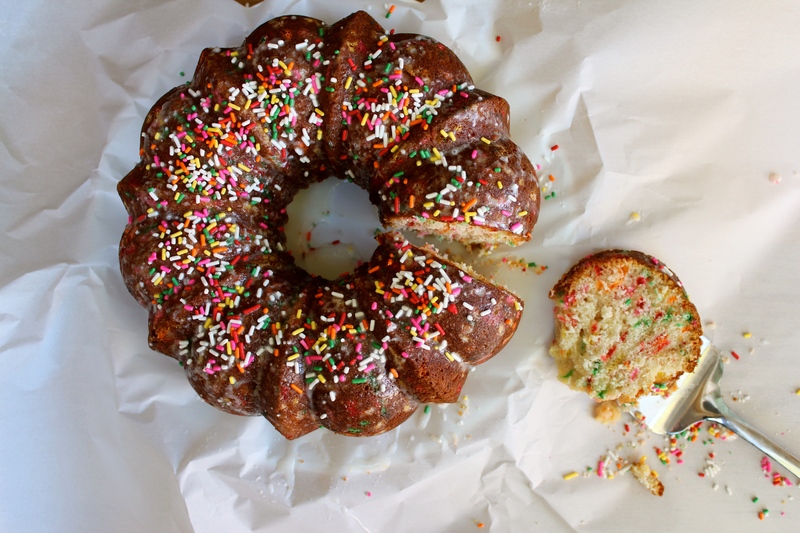 Happiness Project#50: Funfetti Bundt Cake! I’ve been having a very difficult time recently, being alone everyday, particularly as a Mom. Before I had my Baby Girl, I loved being alone & spending more time at home than anywhere else. I was content with my husband and my books and my favorite tv shows. It was ME, then. The NOW me, though, is very (surprisingly) different than that once-comfortable house hermit. Mostly because of my Daughter. Who has changed me, in the best of ways. Thanks to her, I now understand the importance of getting both out of the house and out of my normal comfort zones. For once, I truly enjoy long walks in the sun. And going to the local zoo. And chasing birds. And riding carousels. And simply taking our time while doing whatever it is that we’re doing. Because, yes, my friends, children change EVERYTHING. Something that I am eternally thankful for. Anyhow, even though I’ve discovered a new found appreciation for expanding my daily boundaries, up until recently, I felt perfectly at peace with it being just my Daughter & I. Going out and about and exploring the world (all over again for me) together. Even when we were traveling down south, every month, to see my older sister and her three boys, once a month seemed perfect. Until now. Now, I want to be around my sister and nephews all the time. For myself and my Baby Girl. The connections that both Ari & I have with my sister and her boys are unlike any that we have here (even with the Family that we have within our immediate area). The experience of being a Family with a child, while being with another Family with a child, or children, is incomparable to anything else. With my sister and her boys, I KNOW love. Constant, empowering, comforting love. Where we play and sing and dance and laugh and truly enjoy every moment together. Even when we’re out running multiple errands. Even when we’re saying nothing at all. So whenever that one magical week ends and my Daughter & I drive back home, I end up feeling how I am today. Sad, alone and little lost. Like a huge piece of my Heart is missing and the day is a little less bright without it. A feeling that I sometimes have for days. Which gets worse at night, when the house is quiet and everyone else is asleep. When I have nothing else to think of but memories. So to always commemorate the memories that my Daughter and I have created with the Cooper Family, I’ve decided to share one of my favorite cake recipes. A recipe that always reminds me of my sister and her three loving, affectionate, absolutely amazing boys. All who I love and adore like no other. With one of the happiest candies ever created: sprinkles. Because how can you not see rainbow sprinkles and feel Love? From my heart to yours, may this bright and cheerful bundt cake always bring you happiness, my friends. Preheat your oven to 350F. Butter and flour 1 fluted bundt cake pan. Depending on what type of bundt pan you use, the bottom part of the cake will reflect how light or dark the cake pan is. Hence, since I used a very dark bundt pan, this particular cake ended up being quite brown on it’s bottom (shown in the above featured photo). In a stand mixer, on medium speed, beat together the flour, sugar, oil, baking powder, vanilla extract and salt, until gently mixed throughly. Drop the mixture speed down to a slower speed and add in each egg, one at a time, until fully incorporated. Now, slowly add in the 1 cup of whole milk, using a rubber spatula to scrape down the sides and bottom of the bowl, once or twice to ensure that the batter doesn’t become lumpy or unmixed. Mix for 1 minute until thick and smooth. After taking your bowl off of the stand mixer, gently fold in the 1 cup of sprinkles. Followed by pouring the funfetti batter into the well buttered & floured bundt pan. Pop your bundt pan into the oven and bake for 25-30 minutes, until a toothpick inserted in the center of the cake comes out dry. Let cool on a wire rack, still in it’s pan, for around 30 minutes to an hour until the cake is cool enough to unmold from the pan. In a medium sized bowl, add in all three ingredients and whisk together until you’ve reached a desired consistency. If your glaze is too thin, add more powdered sugar for thickness. If your glaze is too thick, add in a couple of tablespoons of milk to thin it out. And then, drizzle! Drizzle away! P.S. After creating this blog nearly 3 years ago, THIS is my 50th recipe post! Exciting! « Happiness Project#49: In-A-Pinch Chicken Chili!